The Eleutherodactylus frog is one of the smallest known frogs to date. It is a relatively recent discovery as it was found and identified in 1966 and as of yet does not have a universal or common household name as many other frog species do, though in some areas it is known as the Coqui. 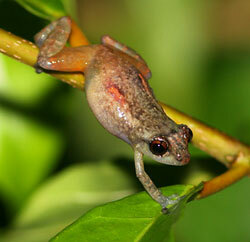 Other names that you may hear it referred to as the Puerto Rican coqui or the coqui comun. The name comes from the loud call that the male makes that sounds like “ko-KEE”. As little as the frogs are, they are quiet loud when they call and their distinctive call has led to their name. The Eleutherodactylus frog is a very small frog that is usually brown or grayish brown in color and measures 1.25 to 2.25 inches long. The colonies that are found in Florida are usually even smaller, not measuring more than 1.75 inches in length. The species has brown, gold, or golden brown eyes, which is different than many similar species that have red eyes. Another thing that sets this species apart is that it has toe disks or toe pads that are used for climbing. The markings on the Eleutherodactylus frog vary from area to area and frog to frog with some having no markings, others having one or two wide cream stripes, v-shaped markings, spots, blotches, or even a pale band or m shaped marking between the shoulders. The Eleutherodactylus frog is native to Puerto Rico and is found in a wide variety of habitats and elevations. It is thought that the frog is found in many different areas because it comes in on landscaping imports, as plants provide shelter for both the adult frogs and their eggs. The introduction of the species has been intended in many areas, such as Hawaii. There are populations reported in Louisiana, Florida, and Hawaii, though Hawaii is trying to limit further introduction of the species to their state as it is highly invasive and the climate lends itself to a comfortable habitat for the frog. The diet of the Eleutherodactylus frog varies widely but generally consists of different invertebrates that share the same habitat. Because of the diet of the frog, the species has been introduced purposefully in many areas to help do away with devastating crop losses due to insects. What has been found is that the frogs do control the populations of insects, but in some instances the benefits of the frogs do not outweigh the negative impacts of them. Hawaii has learned this lesson the hard way and actually has passed legislation to restrict the intentional introduction of the species to the state, though they continue to come in on plants from other areas where the frog is native. What TYPE of insects do they eat?